This is for anyone who may be worried about a food budget over the next few days - you can still do traditional Christmas dinner with all the trimmings on a very low budget. This won't suit everyone nor will it appeal to everyone, personally I've just had enough of buying ridiculous amounts of food during Christmas week and fecking it out to the cat come Stephen's Day. 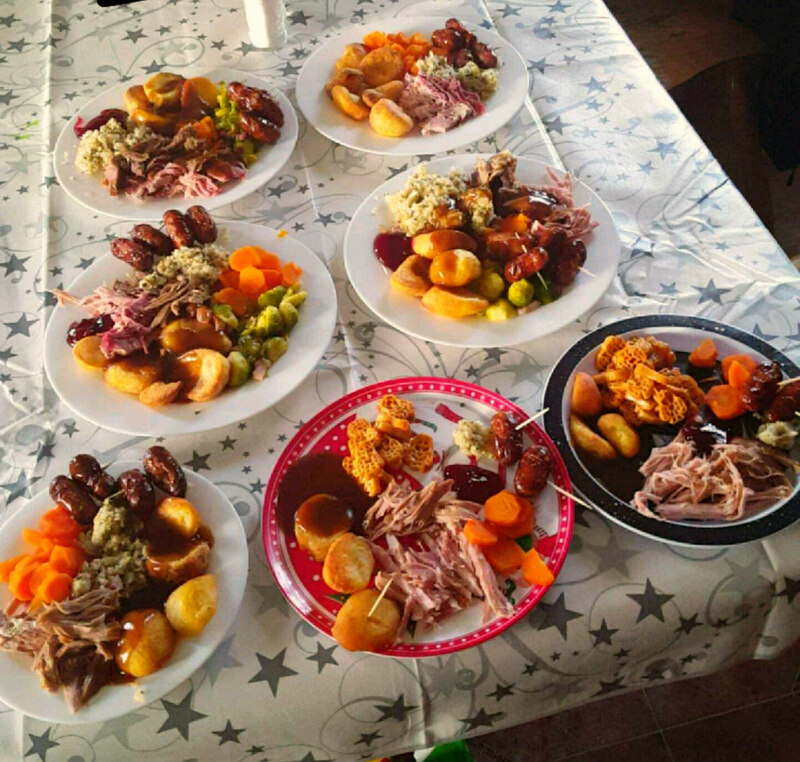 One night last week as I lay in bed thinking about the few bits I needed to get before Christmas, I wondered if it would be possible to do a full dinner on a budget. When I say dinner, I'm talking starter, traditional main course with all the trimmings, crackers and dessert for our little family - two adults, an almost teenager, and two toddlers. I set the limit at €30, and took myself off to the shops the next day. 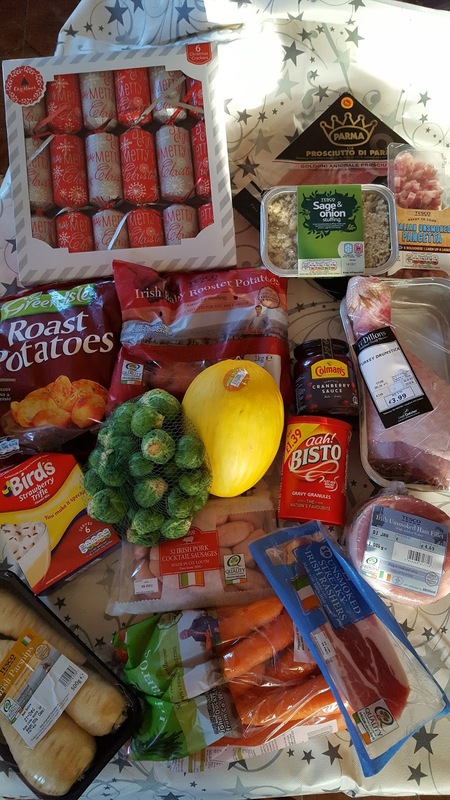 I headed to Tesco, Lidl and the Butchers - now in my experience most shops appear to be price matching at the minute (maybe with the exception of one or two more expensive ones) - so combine that with weekly vegetable/fruit offers and this is a fairly accessible list of ingredients. I always check prices on the Tesco website because they have current offers so I use them as an indication when I go to other shops, e.g. if I know Bird's trifle is on offer in Tesco for €2 and I find a similar product in Lidl for €1.89 - result. If I see it in another shop for €3, then I'll get it in Tesco, and so on. There are currently 39c and 49c offers at most supermarkets. Use a melon baller or teaspoon on a Honeydew melon or cut into cubes. wrap in small slices of Parma Ham or put on cocktail sticks. Get two melons if you need them - they're only 39c at the moment. Cost of Starter: €2.76/ €0.86 per person. Turkey: I bought a large turkey drumstick in my local Craft Butcher. I didn't have to order it. I cooked it in the slow cooker - just put it in on high, no water, for about 4 hours then turned it to low until we needed it. It came out really tender, falling off the bone, and yielded 5 decent portions with a slice or two for everyone. Ham: I boiled a 1kg ham twice (to remove all salt). I didn't bother roasting it but may do so at Christmas with some honey and cloves. Again, this was more than enough for dinner plus leftovers. Potatoes: I bought 1kg of roosters for mashing. I also bought a 700g of frozen ready-to-cook roast potatoes. Vegetables: Carrots, parsnips, plus brussels sprouts. I steamed the sprouts for about 12 mins and then sliced them and stir-fried them on a wok with the ready-to-use pancetta cubes. Stuffing: I tipped the stuffing into some tin foil, made a parcel, and threw it into the slow cooker about half an hour before I took the turkey out. Cranberry Sauce: Loads in this jar, everyone got a tablespoon each. Pigs in Blankets: I wrapped the cocktail sausages in slices of streaky bacon and put them in a large roasting dish, then cooked in the oven, shaking every 10-15 mins until cooked. Then served on the side. Gravy: I mixed up a jug of Bisto according to instructions. Trifle Mix: This is on offer in Tesco at the moment. All you need to add is milk, factor that in to the cost if needs be, also if you want to add tinned fruit to make it go further. You'll still come in under €30. Christmas Crackers: These are €1.50 in Dealz and contain festive selfie props, a great idea instead of plastic rubbish. It fed 7 of us. (The eagle-eyed among you will spot a tin of pasta shapes on the toddlers plates - they asked for them too so I cooked them) - I also hadn't even used the roosters, parsnips, streaky bacon or all the cocktail sausages). Merry (Thrifty) Christmas folks, thanks for all the support this year, looking forward to the chats and bargains in 2017! Yuu did a great job Sharon - I have been you in the Supermarket counting the pennies at Christma. This year I am lucky to have a bit more but the habit has stuck. I am not going mad and if I have a bit extra it will go on goodies for St Vincent de Paul. Fair play Sharon, this looks unreal! So hungry now! Look Fantastic Advent Calendar 2016 - Worth €95? stylPro - Yay or Nay?